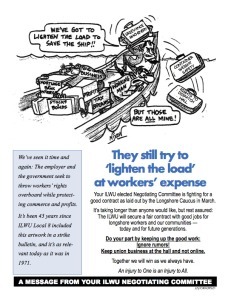 Ever wonder what the ILWU does when they are not at the negotiating table? This inside artist’s rendering of what the ILWU elected officials do when they are not negotiating cost the member who put it out, 2 years off work even though PMA said no violation occurred. Nurse Chris got his buddy, Industry Arbitrator “Judge Roy Bean” Miller (not in the rendering), to give the member who used it in his election flier 1 year off for slander. Then Nurse Chris got his buddy to give the member a 2nd year off for retaliation, after incident in the alley. If you want to know who is who, ask any Local 13, or International officer, or the Port Medical nurse, Chris Viramontes. ILWU gets into PR business. – They should stick to loading/unloading ships, safely. Did the ILWU think that we would forget that they walked away from the “big” negotiating table, if they re-print a picture of some scrap yard chassis and point out something that everyone already knows? What makes the chassis discussion interesting, is that I heard that when the shipping lines decided to get out of the chassis business, it was some longshoremen who were trying to convince others, including teamster officials, to invest in the new chassis leasing businesses that were forming. Don’t know if any did, now I am even more curious. Does Local 13 think that pictures of scrap chassis will negate the fact they unilaterally cut 100 crane operators, by deciding to dispatch only “certified” crane drivers? For the last 3 years Local 13 has been dispatching up to 200 crane jobs per day, filling 100 of them with “qualified” (but not “certified”) crane drivers. Even when they only take 100 orders, they are still dispatching “qualified” (but not “certified”) drivers. If Big Bob and his crew spent half the energy they are exerting playing their blame game, on negotiating a contract, they could have finished before turkey day. Perhaps the rank-and-file could send a message to Big Bob and his crew – GIT ER DONE, we are tired of your games, DO YOUR JOB. Call the ILWU International and let them know how you feel. Call Big Bob at 415 775-0533, or fax him at 415 775-1302. Tell him to GIT ER DONE. 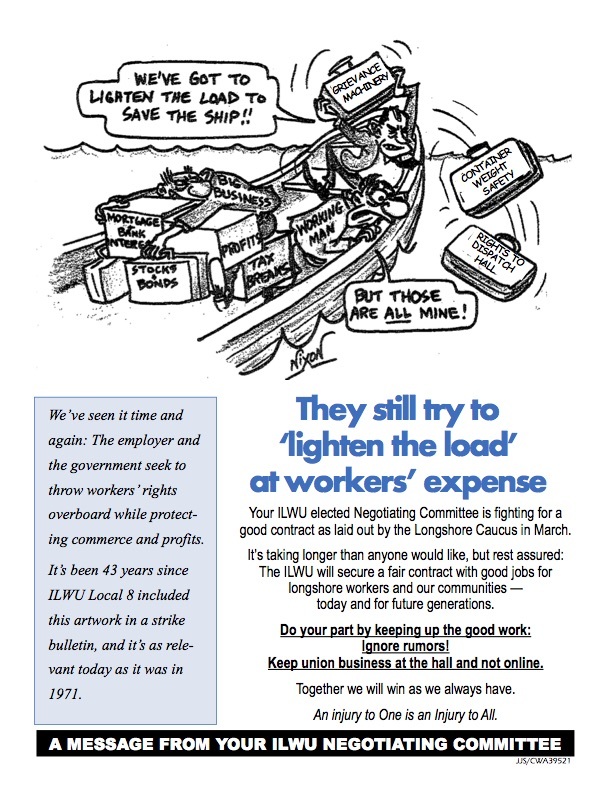 Retro ILWU protest cartoon – Ahh the good old days…….. Remember – don’t post anything, except this, on the internet. If you are a union member and you are reading this, you are just like everyone else. Members in good standing who have outstanding fines or assessments are allowed to read, just don’t tell Bobby. “Qualified” vs “Certified” Crane Drivers & Transtainer Manning – Whats Up? 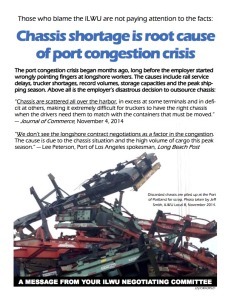 Local 13’s (Bobby’s) decision to only dispatch certified crane drivers, to drive equipment designated as longshore cranes, is hurting the PMA as well as his own hall men. The decision to only allow “certified” crane drivers take crane rated jobs not only hurts the PMA, it slams the hall men who are both competent and experienced and denies them the work they have been doing for years. There is no excuse for refusing to allow hall men to fill the jobs they have always filled. The Union has a obligation to supply longshoremen and members have a right to choose any skilled job they are qualified for. The employers have been ordering 2 men per transtainer since at least 1974 according to SC-95-74 10-24-74. In CLRC #25-79 11-9-79, item 6, the Committee approved the Employer’ request that the Paceco transtainers used my Matson in Los Angeles be designated “longshore cranes” in accordance with Section 14.21 of the PCLCD, and since then the employers have ordered 2 men per transtainer. However, Section 14.813 has been in the contract since 1962, and according to Coast Arbitrator Sam Kagel, sleeping on your rights does not abrogate them, so the Employers decided to exercise their right to order 6 crane drivers for each 5 transtainers. I do agree that eventually the employers will probably go back to ordering 2 men per transtainer, but Local 13 really needs to reconsider the decision to only dispatch “certified” crane drivers to crane jobs, it’s hurting the hall men and the Union. What kind of father leaves his kids to fight the family’s battles? According to Twitter, the ILWU offered to work up to November 27th and PMA did not reply, so they decided to leave yesterday. If you are sitting across the table from each other, how do you not get an reply? PMA is sitting on their thumbs and doing nothing to force the ILWU to continue to bargain. Where did these guys learn to negotiate? Actually this is sort of interesting, now the whole world can see how the PMA deals, or doesn’t deal, with the mighty ILWU. Why are the “little table” guys still working, while the “big table” guys go home? Most of the longshoremen, no, all the longshoremen, I know, feel none of their negotiators should leave any of the tables until they have an agreement. They feel Big Bob should lead by example and work non-stop until he gets an agreement. Be that as it may, all the longshoreman will do what ever their Union leaders ask of them, whether they agree or not. That is why the ILWU is a powerful force. Maybe some guidance is in order? Mike Dimon, Grievance Committee Chairman; 1part Judge Judy + 1 part Judge Roy Bean + 2 parts cracked out. The honorable Mike Dimon held court again last night at the Local 13 Grievance Committee meeting, only this time things did not go exactly as he planned. The meeting started out with the run of the mill chiseling complaints, like the first time offender who added 6 hours to a flop that he did not need to. No one tapped his shoulder and pointed out his error, so Larry, the self appointed chisel patrol, made a note, said nothing, waited till the end of the month, and wrote him up for a $6,000 chiseling complaint. Grievance Committee Chairman, Mike Dimon, and Attorney of Facts, Jonathan Lamborn, laid down the law and said they were going to assess him a $500 fine and told him that he can let the rest of the $6.000 sit and after 5 years it will be forgiven. This is how they help members and enforce the dispatch rules. In one fell swoop, Mike and Jonathan make $500 for the Local and create another member with unpaid fines and assessments. Another member who cannot sign a recall petition, or double out, or travel, or transfer, or train on equipment, or run for elected positions, but who can vote as a member in good standing as long as his dues are paid. What happened to helping members, especially first time offenders? When did the union change from helping members, to bullying members? To protect the innocent, I cannot write about what other fun and games were played at last nights meeting until after they are finished. However, what I can say is, a lot of lip service was given to “due process” and democracy, which worked out well for one member who got their grievance held over so the evidence could be played at the next meeting. If I were a member of Local 13, I would attend the next Grievance Committee meeting because it will be very interesting. ILWU spokesman Craig Merrilees admits to Union slow downs, during KCRW radio interview. During a November 13th radio interview on KCRW News discussing the congestion in the ports of LA/LB, the ILWU admitted to slowing down. 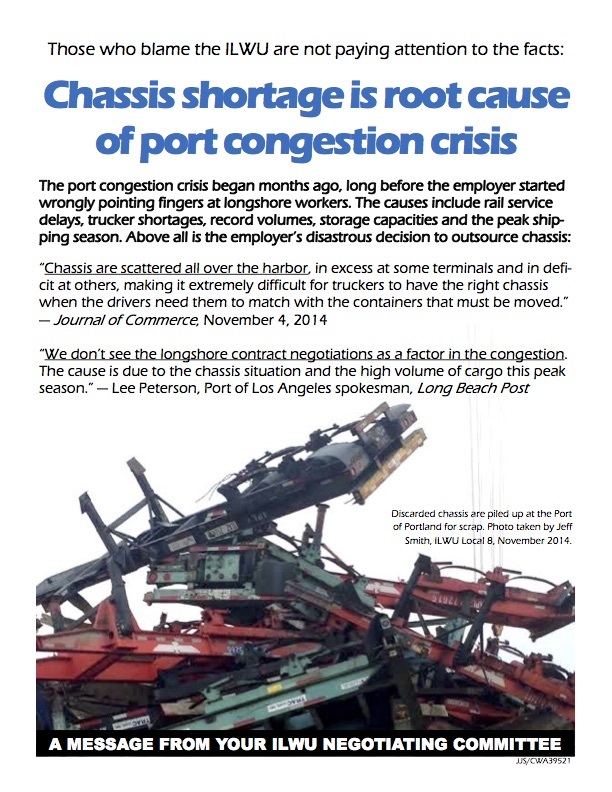 The interview is mostly 2 PR guys spinning their respective positions, but near the end Craig Merrilees admits that longshoremen are working slowly and explains that is their way of demonstrating their dissatisfaction and frustration related to the progress of the negotiations, and port congestion. Mean while back at the ranch, the negotiators are negotiating, although it is hard to tell when everything is secret except for the income of longshoremen and the fact they have $1 prescription co-pays. PMA should stop trying to do selective negotiating using their press releases and get down to business. PMA should implement their last and final offer and/or lock the gates. It will all be over in 2 weeks. Normal negotiating rules, like lots of other rules, do not seem to apply on the waterfront. The PMA and the ILWU have left the playing field, so the normal rules of the game no longer apply. Based on PMA’s latest “update”, it looks like PMA is feeling the pressure from retailers and politicians. PMA is asking to have the “contract extended” just like they did the last time right before the teamsters sent pickets, before the Mayor cut a deal to keep them away from the docks. Are they asking because they are concerned that the teamsters are going to reappear or are they setting the Union up for a lockout and Taft-Hartley intervention by the Government? Why would PMA highlight the “most lucrative” wages and benefits the the ILWU receives, when they know that it will just piss off the Union and the membership? Are they trying to negotiate in the press, or are they trying to make the Union angry in hopes they will do something dumb so they can lock them out and initiate Taft-Hartley intervention by the government? In LA/LB the Union is telling workers to ignore trucker pickets (non-teamsters), because there is no contract, and to keep working safely. It’s working. Bobby seems more interested in getting a certain caucus delegate kicked out of his elected position, and what is being posted on Facebook, than telling his members what is happening at the secret negotiations in San Francisco. In Tacoma, at last night’s Union meeting, Dean mcGrath told his members nothing about what is happening at negotiations. He told them to keep doing what they are doing, it is working. He and Conrad Spell spent most of their time complaining about members who are talking to “the guy who has that website” and threatening to get who ever it is, when this is all over. Interesting that Dean and Conrad had no problem with the PMA update, but are freaked out about what they read here. Glad to know you guys have your priorities in order. The Greek fined $6,000 and barred from running for Union Office for 13 years, after Bobby O Jr.’s Trial Committee charge. Angelo “The Greek” Anikos has been elected Business Agent 2 times, but he is not part of the clique that has controlled Local 13 for the last 20 years, and he was posing a threat to run for President so Bobby O Jr. and his crew decided to take him out, by using the Trial Committee. Angelo did not misuse his position to force the Employers to compensate him for compensation for work hours for services not performed, he put his name in along with others for in-lieu-of payments and/or lost work opportunity claims related to Employer violations of the PCLCD. No Employer complaints were filed related to any of the payments. Angelo did not decide to do what he did on his own, he was doing the same thing other Business Agents were doing and what he was taught to do by other Business Agents. It may seem inappropriate to some, but there are no rules governing the assignment of in-lieu-of’s and no one told him it was forbiden. According to the documents, Bobby claims the practice started in the middle of June and stopped after a meeting Angelo, Bobby and Mark Williams had with the Local’s lawyers, who explained it was not a recommended practice. The lawyers also recommended doing nothing, other than stopping, and Mark agreed, but Bobby had other plans. 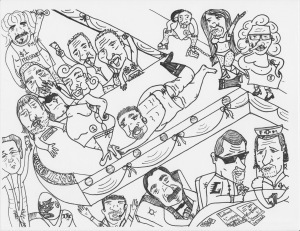 Bobby wanted to eliminate Angelo from the competition for the position of President and set out to demonize him, then use the Trial Committee to bar him from running for Office. Bobby did not once tell Angelo that he should stop, or that there was anything wrong with what he was doing, instead he stood by and watched and waited for Angelo to do it 14 times, then wrote him up for conduct detrimental to the Union. How do you watch a guy do something 14 times, say nothing, then bring him up on charges? In fact on May 28, 2014, Bobby used his position as Local 13 President and called company 740, Pasha steel dock, and got his Superintendent friend who used to live across the street to put both “The Greek” and “Scary Jerry” on the payroll, for ghost lashing jobs, bypassing the Dispatch Hall, in complete violation of the dispatch rules, in exchange for watching his mom while they all attended a luncheon at City Hall. Bobby’s August 5th Charge requests “election” of a Trail Committee. At the meeting 26 members signed up, one of them an Executive Board member, even though Mike Plante was told he could not sign up because he is on the E-Board. One member got so excited, he signed up twice. Instead of electing the Trial Committee in accordance with the Constitution and the agreed to Trial Committee Guidelines, Mark decided to draw names out of a hat with a Local 13 secretary, in secret. No witnesses. In secret. When Angelo questioned the way the committee was selected, and questioned the inclusion of union officials despite the past practice of excluding officials in favor of regular members, he was told everything was done correctly and the Trial Committee was proceeding. When Angelo pointed out that the Local had only informed him one day before the hearing that they did not cite witnesses, and he asked for additional time to cite his witnesses, he was denied and told that the Trial Committee was proceeding. When Angelo explained that he was under the influence of prescription medication, unable to answer questions, and asked to reschedule the hearing, he was denied and told that the Trial Committee was proceeding. After Angelo left the hearing feeling ill, the Trial Committee proceeded to find him guilty as charged, fined him $6,000 and told him he is barred from running for Union Office for 13 years. 13 Years? Really? How do you come up with 13 years? 11-15-14 OK – Checked it out. According to Section 504 of the LMRDA, if a person is convicted in court of certain crimes they are barred from holding union office for 13 years. Convicted after a real trial in a real court, not a kangaroo court using the what ever they feel like rules. By the way, the OLMS also prohibits individuals who knowingly make false statements of material facts or fail to disclose material facts in any labor organization report required by the LMRDA, like the LM-2, from holding union office for 13 years, Mark Williams. Interesting that the guy running the Trial Committee procedure that barred Angelo from holding office for 13 years, is the guy who knowingly filed false LM-2 reports required by the LMRDA. Who knows, when the DOL is done with their investigation, Mark Williams might be the guy who gets barred from union office for 13 years. Looks like working safely has inspired both PMA & ILWU, word is they are making progress at negotiations. Seems like the Art of the Slow Down has once again paid off for the ILWU. Word is that the parties are back at the bargaining table, and making progress, and equalization for crane operators is being discussed. Once again the hall men are taking the hit for their Union. In LA/LB the employers have started to order 6 men for 5 transtainers, out of the hall, while steady men are shifted to operate transtainers in pairs just like they always have. The Employers continue to play the steadies against the hall men, and they are creating an even bigger rift in the membership over the use of steady men. Bobby O Jr. told the membership at the Union meeting, that the transtainer cut backs are going to be just like the swing men cutbacks from the last contract, the union will eventually pressure the Employers to hire back the additional men, just hang in there, it will be ok.
Based on past experience, he is right. The Art of the Slow Down is paying off again. Go ILWU, or should I say Go Slow ILWU.